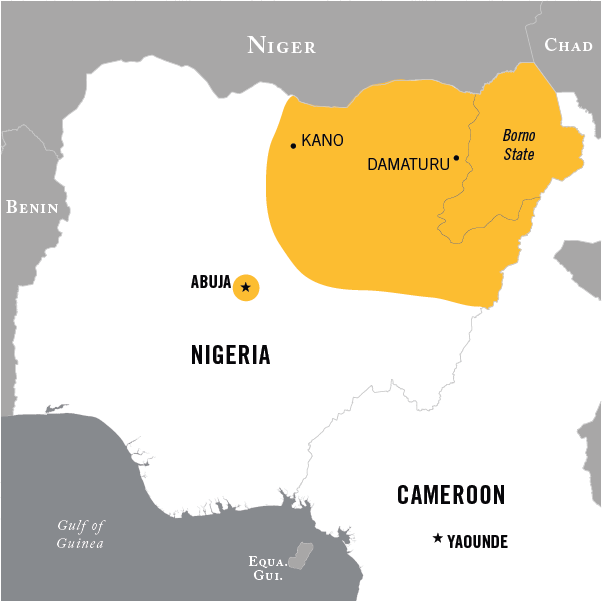 Boko Haram is an extremist group who's roots lie in grievances over colonialism, religion, income distribution, and power who have been waging war in Northern Nigeria and in surrounding countries. Some of the drive is the result of population factors along with an environment that is limited and may be decreasing due to climate change. There has been a longstanding rivalry between north and south in Nigeria. But this conflict is with both the north and south establishments. They oppose the ruling leaders in the northern areas that are largely Muslim. There have been as many attacks on Moslems as there have been on Christians. Boko Haram has been able to take root in part due to deteriorating climate conditions during a time of demographic increase. As a result, many young men (especially) have come of age when not even farming is a viable career path. The group's name derives from an expression meaning roughly "Wester education is evil". What they dispute is the value of that education in a corrupt and rigged society. There is also an element of long-standing north-south tensions in Nigeria, between it's Muslims and Christians. In a speech to the U.S. Coast Guard Academy on May 20, 2015 President Barak Obama cited Boko Haram and ISIS as products of environmental conditions. Thye occur in a time of increasing social expectations juxtaposed against decline environmental realities. "I understand climate change did not cause the conflicts we see around the world, yet what we also know is that severe drought helped to create the instability in Nigeria that was exploited by the terrorist group Boko Haram." Boko Haram's activity have worsened drought conditions by driving farmers off their land and displacing them. This had lead to a hunger crisis. Boko Haram is concentrated in the northeast portion of the country. From this base it has launched attacks throughout the nation and into several adjoining countries. In 2010, Abubakar Shekau announced that the group would be taking it's campaign to a violent level. His rise to power was rather clouded, but it did mark a substantial uptick in Boko Haram activities. The Nigerian Army has won back territory since the beginning of the Buhari regime. This violence has spread over several countries. The 2014 Climate Change and Environmental Risk Atlas by the firm Maplecroft cites Nigeria as an example of conflict risk due to drought and food shortages." It is also part of the lifestyle struggle between pastoralists and farmers in a line stretching across the Sahel. This region is normally rather dry but climate change has dramatically changed the livelihood calculus. Bok Haram regularly raids from Nigeria into other countries. Boko Haram has taken over villages and abducted thousands of people. They have been responsible for numerous suicide bomb attacks, many using youg boys and girls. Over time, Boko Haram attacks have spread to neighboring countries. The war began as a Nigeria civil conflict. One source put the total casualties at 5,000 (see Mother Jones). The overlap with extremism and environment in this case and many like it is becoming more apparent. 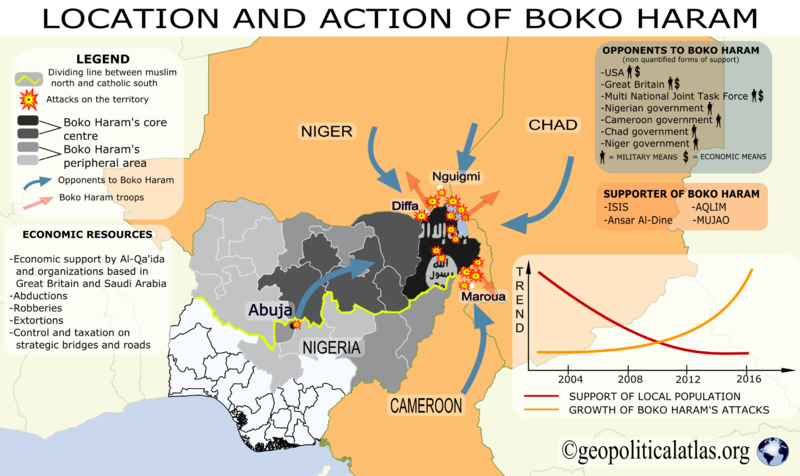 Chad, Mali, Burkina Faso, and Cameroon have seen Boko Haram activity. There are also alleged links from Boko Haram back to the Islamic State and Al Queda. Thus, they are said to link to other groups in Mali and Algeria. Recent efforts by the governments of Nigeria, Cameroon and Chad have dramatically reduced the area of Bob Haram control. However, they still control some rural areas and engage in terror attacks. Martin W. Lewis, "Does the Boko Haram Insurgency Stem from Environmental Degradation and Climate Change? ", Geocurrents, June 5, 2014.